This Middle East-inspired stew is perfect for the first day of your holidays. Make it the day before you go, then reheat when you get there - it will taste even better then because the flavours will have had a chance to develop. To avoid spills, tape down the casserole lid with wide masking tape. Keep chilled. Heat the butter or oil in a flameproof casserole and fry the onions for 7 minutes, or until softened and lightly coloured. Add the chicken and stir well, until it is sealed and lightly tinged with brown. Stir in the spices and mix until the chicken is well coated. Add the stock and seasoning and bring to a simmer. Stir well, then cover and simmer for 20 minutes. 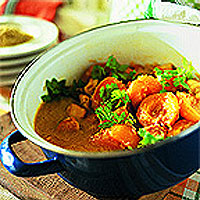 Stir in the apricots and cook for a further 15-20 minutes, or until the chicken and apricots are tender. Taste and add more seasoning if necessary, then stir in the lemon juice and coriander just before serving. Serve with rice or couscous. To freeze the stew for up to a month, cool fast at the end of step 2. Use the same dish or a rigid container. Defrost overnight in the fridge, reheat gently for 20 minutes, check seasoning and stir in the lemon juice and coriander.